I have clearly been enjoying my summer so much that I've neglected my little blog. I'll get into that in another post, but for now I have a great summer recipe for you! A few weekends ago I helped John's grandma, Mimi, make these steak fries. I've had my wonderful mother-in-law's version of these for years, and I absolutely love them. Last weekend we went to the lake with some friends, and I decided to recreate Mimi's recipe. The fries were a huge hit! Even better? They are so easy to throw together and absolutely delicious. I hope you are enjoying your summer. I've missed you all, and I would love to hear what you're up to. Until next time! *Preheat oven to 400 degrees. Melt butter on a stovetop or in the microwave. *Prepare potatoes: I cut each potato in half (lengthwise), and then each half into four slices, for a total of 8 wedges per potato. *Distribute sliced potatoes evenly onto two sheet pans (you don't want them to crowd too much or they won't get crispy). Pour the butter evenly over the potatoes on both pans. Season with salt, pepper, garlic powder and Lawry's (I didn't measure - season to your taste preferences). 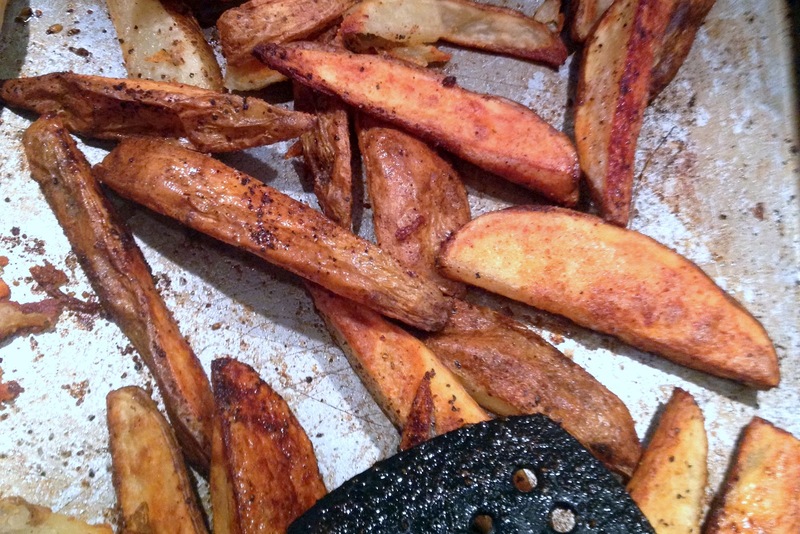 Gently toss the potatoes to distribute butter and seasoning. *Place in preheated oven and bake for about an hour. I suggest tossing them about every 15-20 minutes so they're evenly crispy and browned. Enjoy! For crispier fries: Bake for 30 minutes at 425, then turn oven down to 400 and bake for an additional 30 minutes. Almost forgot to snap pictures...but here they are in the oven! I love steak fries! These look delicious!